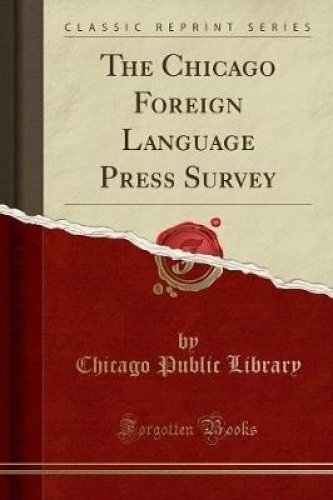 The Chicago Foreign Language Press Survey (Classic Reprint) by Forgotten Books at Translate This Website. Hurry! Limited time offer. Offer valid only while supplies last. Excerpt from The Chicago Foreign Language Press SurveyBecause of a curtailment in the wpa program, the Survey was terminated in October 1941. Because of a curtailment in the wpa program, the Survey was terminated in October 1941. Although it was not possible to examine all of the newspapers originally planned, the bulk of the work was completed.